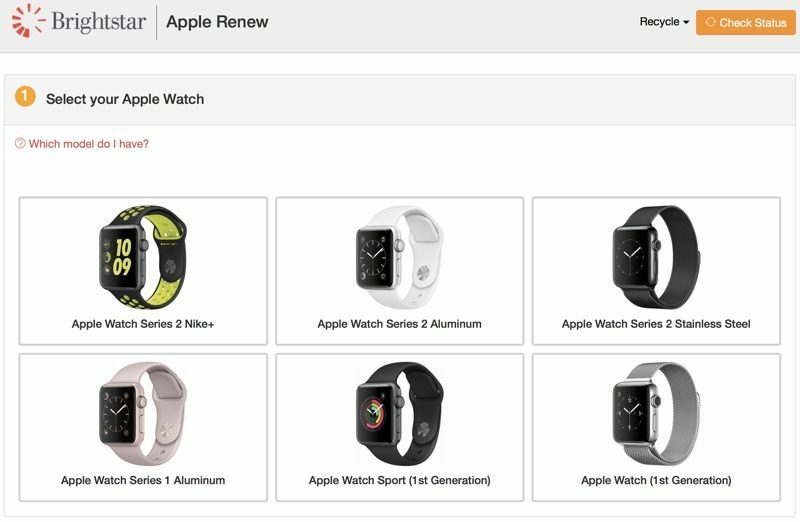 Apple today updated its Renew and Recycling program for the Apple Watch, offering Apple Store gift cards for older Apple Watch devices that are in good working condition through a partnership with Brightstar. Apple previously allowed customers to recycle the Apple Watch through its recycling program, but there were no gift cards offered. Gift cards received from recycling products can be put towards new devices purchased from the Apple Store, either at retail locations or online. Gift cards are available for original Apple Watch models, Apple Watch Series 1 models, and Apple Watch Series 2 models, with Apple offering between $50 and $175 depending on device. For a 42mm stainless steel Apple Watch Series 2 in full working condition, for example, Apple is offering $175, which is the highest payout available. For an original 42mm Apple Watch Sport model in good working condition, Apple is offering $50, the lowest payout. These prices are lower than what you might get attempting to sell a device on your own, but higher in some cases than the prices available through other trade-in programs. Working condition means the device powers on, the enclosure is in good condition, there are no obvious signs of liquid damage, the display is in good condition, and the buttons are operational. Apple does allow for normal wear and tear when it comes to the display and the enclosure, however. Apple is only offering money for Apple Watch devices that meet all of the above restrictions. For devices that are damaged in some way, Apple offers free recycling through Brightstar, but no gift card. 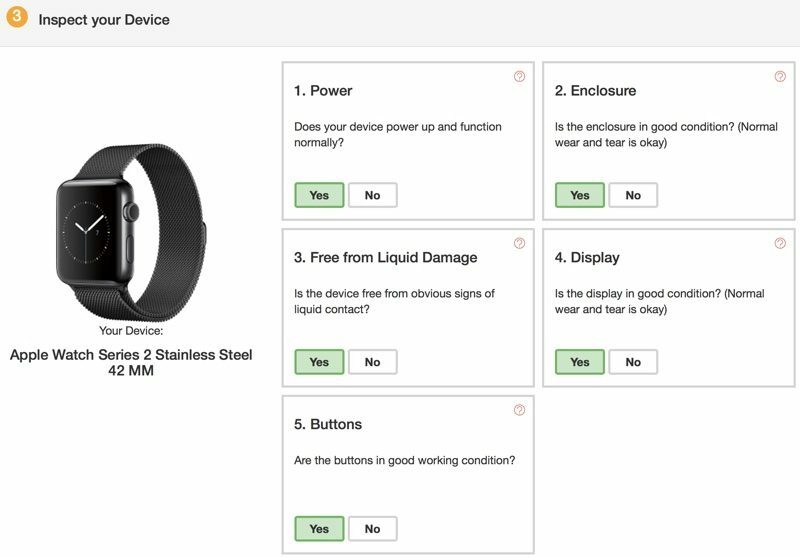 When recycling an Apple Watch through Brightstar, the company will allow you to use your own shipping or it will send a free shipping box. Customers must make sure the Apple Watch is free of all faults, all data has been wiped, and that the battery is fully charged. It does not appear that charging cables nor Apple Watch bands need to be sent with the Apple Watch. Apple, in partnership with Brightstar, also offers gift cards when recycling a range of older iPhones, iPads, Macs, PCs, and smartphones from third-party manufacturers. Be careful with Brightstar, they're well known for scamming people. Recently got a quote for $145 for my wife's iPhone 6. Sent it in in full working order (had always been in a case with a screen protector). They tried to send back pictures showing light coming from the edge of the display, as if the glass had been pulled from the screen. They then offered $0 for it. I refused and told them it wasn't in that shape when shipped to them and they told me to file a claim with UPS. I told them I'd just take them to court. They called and left a message offering the full $145 then but said I first had to accept the $0 amount online and they'd process it manually. I called back about it and they didn't know anything about the new offer but said if someone told me that then I should do it and they'd note it for their customer support guys. I did it and didn't hear anything for a week or get the card so I called back again. This time they told me that they didn't see anything on it but when I told them the story they "looked into it" and "Oh yeah, now I see that's the case." They then said the card had been emailed the week before. We hadn't received anything so they said it'd be another few days to re-issue it. Eventually we got the gift card but it took a ton of work and it was clear they were trying to do anything they could to avoid paying and keep the phone. Check out the reviews of Brightstar. Lots of people have been scammed and had Brightstar keep their device too. Be VERY careful. That is ice cold if that's really true. I still can't believe the gold watches didn't come with a lifetime upgrade for the internals of the watch. $17k for a watch thats now worth $150, meanwhile a $17k Rolex will eventually be worth more than you paid for it. Holy crap! I will definitely not be using them in the future. That's an insane amount of people. I'd be better off risking Craigslist. Try Amazon Trade-In, I got $155.00 for my 42mm space gray aluminum G2 watch and I'll take an Amazon card over an Apple card any day. Almost zero extra value in stainless models, I consider watches almost toss away, so aluminum for me and roll annually with Amazon trade-in program. Apple "should" offer better trade-in than anyone, but no, just yet another thorn in my relationship with the borg. Expensive hardware thats up for recycling at only 2 years old just seems totally nuts to me.. They need to introduce an Apple Watch Upgrade Program, like the iPhone Upgrade program. Set monthly fee where you can upgrade every year.